We write today in a spirit of total gratitude and thanksgiving. As always, God’s grace continues to astound and bless us. Exciting things have been happening around the Inspiration Centre these days. 1. The purchase of our land is finally complete! We cannot thank Denver Community Church enough for helping to clear the outstanding balance. This was made possible through pastor Dave Neuhausel. We would also like to recognize Centre for Transforming Mission, Mile High Ministry and Bear Valley Church for their part in helping purchase the land. Thank you! As we’ve said before, the purchase of land has been a longstanding goal of the Centre and will assist us to better serve our community in new ways. We still have a long way to go in achieving our ultimate vision for the space. Join us in prayer that God will continue to bless us in this project. 2. We now have our own 100-person capacity tent that was generously donated to us by Christ Community Covenant Church through the help of Rick and Pam Gager. Thank you! We can now hold our church services on Sunday outside our small room — a huge improvement from our previous dark and cramped space! We will also be able to rent the tent out at a small fee to generate some income for our other programs. Inspiration Centre members young and old gathered in celebration and thanksgiving last Sunday for our first service in the tent. 3. 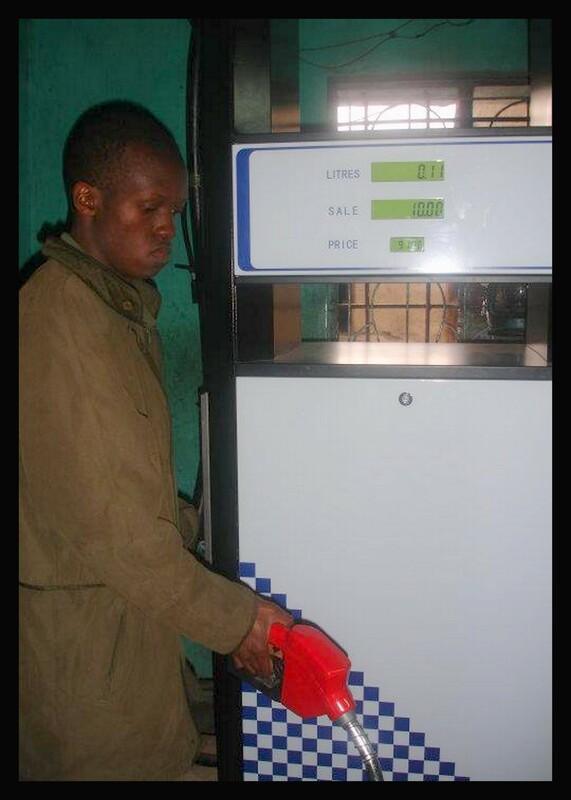 We have upgraded our kerosene business from using a manual machine to a digital machine which was generously made possible by the Denver Rescue Mission through the vice president, Steve Walkup. Thank you! The machine is more efficient, accurate and can serve many customers. Godfrey (pictured) will continue to manage the pump with the help of fellow Inspiration Centre member Boniface. Our innovative pairing of business and ministry not only allows us to fund our own programs and minister to a broader community, but it also allows us to support a thriving local economy by offering employment opportunities to our own community members. 4. And on that note, Inspiration Centre has opened yet another micro-business! 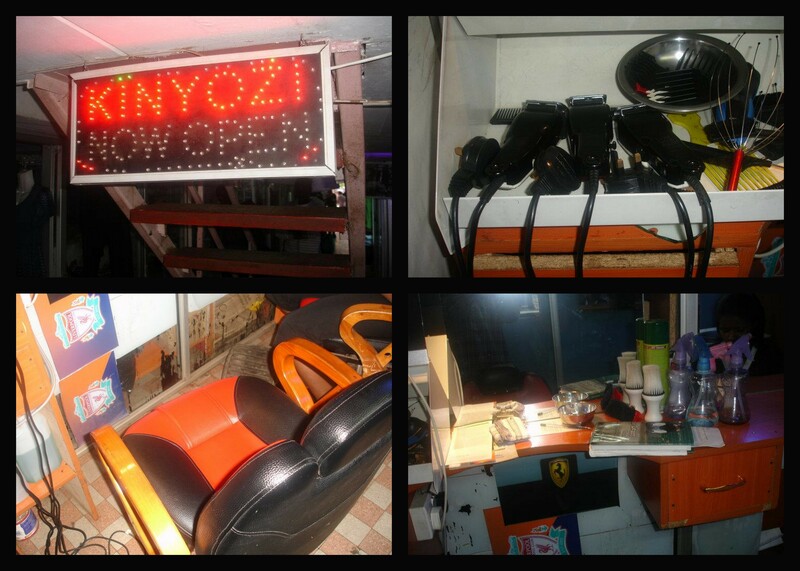 The new Kinyozi, or barber shop, is located in the city center of Nairobi. Moses’s cousin Rafeal has been a barber for several years, and will help to run the chair with another woman and man. This is the most challenging project yet, bearing in mind that it’s the first business venture we are doing outside our community in Mathare. We chose to locate the kinyozi in the city center because most of Rafael’s clients work in town and have a few minutes to spare for a barber when in town. People will also pay almost eight times as much as those in Mathare since clients include doctors, lawyers, business people, etc. 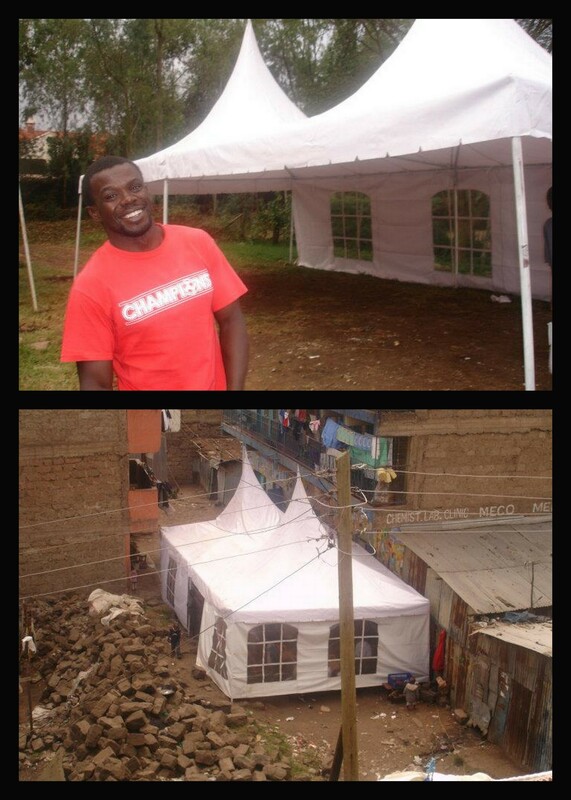 Finally, it will also give us an opportunity to minister to those outside Mathare. Like our other businesses, the kinyozi will bring in revenue for the Inspiration Centre, helping us achieve our goal of financial self-sufficiency. We thank you all for the support, either through monetary or through your prayers and kind. We are humbled by the way that God continues to provide for this organization through your generosity. 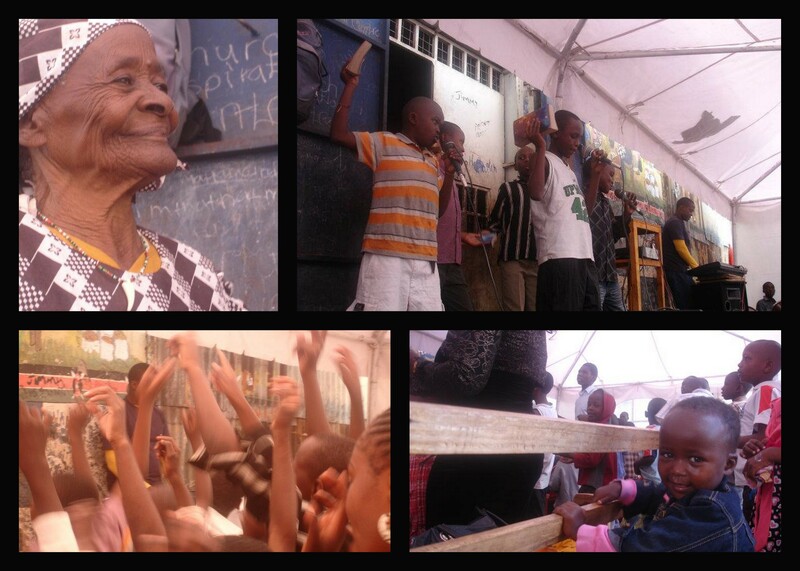 What started out as just a seed in the hearts of a few individuals is truly blossoming into a transformative, multi-dimensional ministry serving both the spiritual and physical needs of Mathare, Kenya. Jesus said, “I tell you the truth, if you have faith as small as a mustard seed, you can say to this mountain, ‘Move from here to there’ and it will move. Nothing will be impossible for you.” How true this has been for us lately. May God bless you all! It’s back-to-school time once again. Inspiration Centre took 90 kids (our biggest outing yet!) 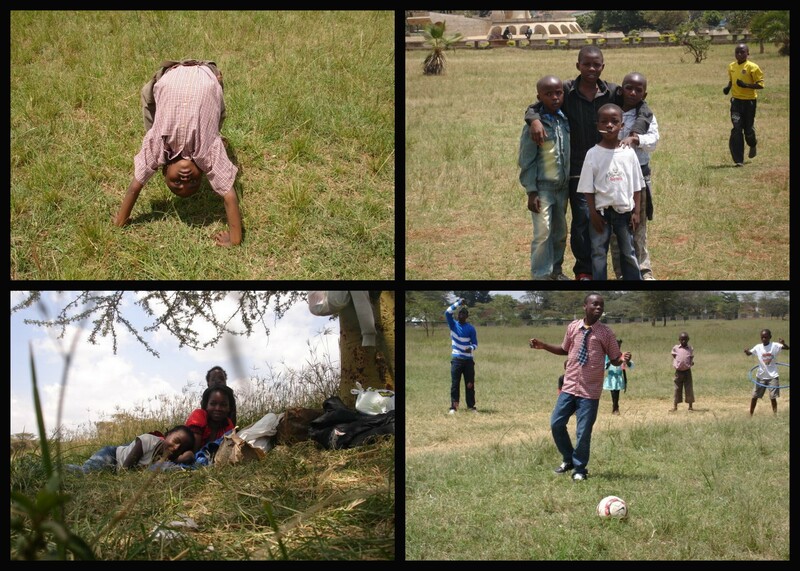 to have a wonderful picnic in Uhuru Gardens on Friday to bid our students kwaheri before they return to classes. As always, everyone had a great time playing games, dancing, relaxing, and hanging out with friends. 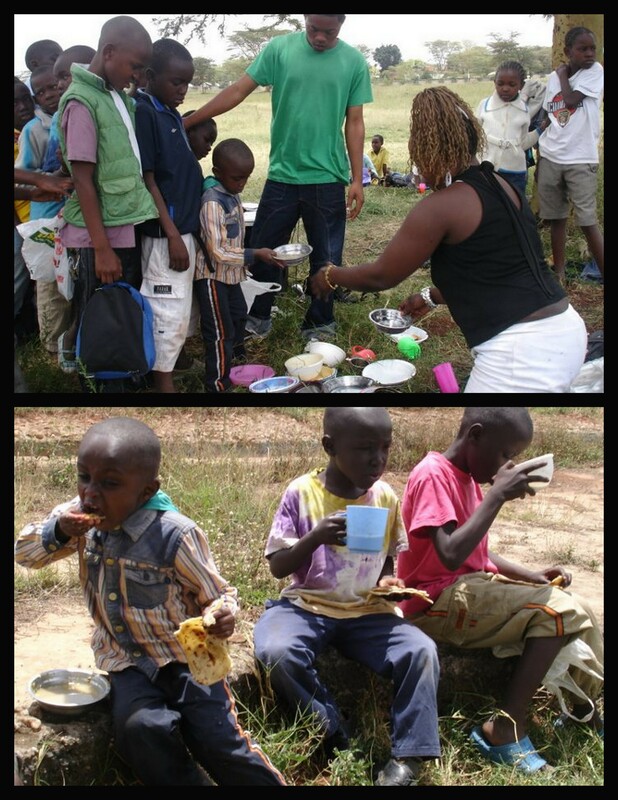 And of course, chowing down on some delicious food made by our wonderful volunteers! Requested the students to bring report forms at the end of the term. This should help those who didn’t perform well to learn to improve. He advises those who will be joining high school to work hard and get into a good high school so that they don’t end up in a school like his. He is also facing a lot of challenges with school fees. She needs help on how to manage her time and not to forget things she’s taught in class. She has also been losing her personal stuff like gumboots, soap, etc in school. She’s also distracted by other students and hopes to like biology subject. Faces challenges in time management. She wastes a lot of time waiting for the bell to ring for her to move from one point to another. She also finds mathematics very challenging. He is concerned about drugs in school (especially marijuana) and security problems, especially when walking early in the morning to school. Waking up in the morning is a big challenge especially when it’s cold. His family faces sickness challenges. He also needs prayers as he sits for his final exams in primary school. He needs to learn how he can express himself individually with the usage of words like “I” instead of “we”. He hopes that this will make him more accountable and responsible. Was sick for the better part of the term and even missed some of the end term exams. Transferring of some of his teachers makes it hard for him to adjust with new teachers. Being in a new climate last term at her school made her sick. Sharing of text books makes it hard for her to study privately. She also faces challenges studying at night since electricity is only available during the day. He has a problem in concentrating while studying. He can remember every scene of a movie he watches, every song he listens to but can’t remember what he reads in class. College is a tough place where many friends like wasting time with social media stuff like internet, facebook, etc. He needs to chose good friends. Reminds everyone that boarding schools are not prison; it’s in the mind and the heart. She was in one of those and managed to pass well and now she’s studying to be a doctor. She advises that those problems at home should be used by the students as a drive/push to succeed. She challenges students to be jealous in a positive way. She’s praying that she can get a laptop to help her with her college work. She still faces challenges for bus fare to college which makes her to miss or be late and tired in class. Her neighborhood is dominated by a gang (Mungiki). She had a quarrel with some members of that gang and fears that her coming late from school may be a security risk. A negative attitude towards the teachers has made him dislike the subjects those teachers are teaching. Peer pressure from his fellow students has also made him to chose subjects based on what his friends have chosen. He cautions students from lying or coming up with vague excuses like faking that they are sick when they are not to get out of class or doing work. He thinks that when students lie every time, whatever they lie about eventually turns into reality. He encourages students to remain positive in school. He has relatives who works at his school and they don’t like his family. The smell of weed in his neighborhood makes it hard to concentrate on his studies. Transferring of teachers makes it hard for him to start getting used to new teachers. The influence of sheng (slang) language has affected his English and writing. Please keep these students in your prayers as they go back to school. If you would like to help support an Inspiration Centre student, please contact Moses about our school sponsorship program.